Evensong at Duke Chapel is a small part of something bigger; it is part of the worship which is offered to God by people in every part of the world throughout the day and night. When you come to Evensong here, you are witnessing a conversation already in progress - a conversation between God and God's people which began long before you were born and which will continue long after your death. Because of this, do not be surprised if there are some things you do not understand right away. Much of the English in the service is the language spoken and written by our ancestors more than four hundred years ago and drawn from the 1662 Book of Common Prayer. It may sound old-fashioned but its relevance and meaning are not out of date. Distinct from the noisy world around us, Choral Evensong thickens our imagination for mysteries yet undisclosed and realities yet unknown. 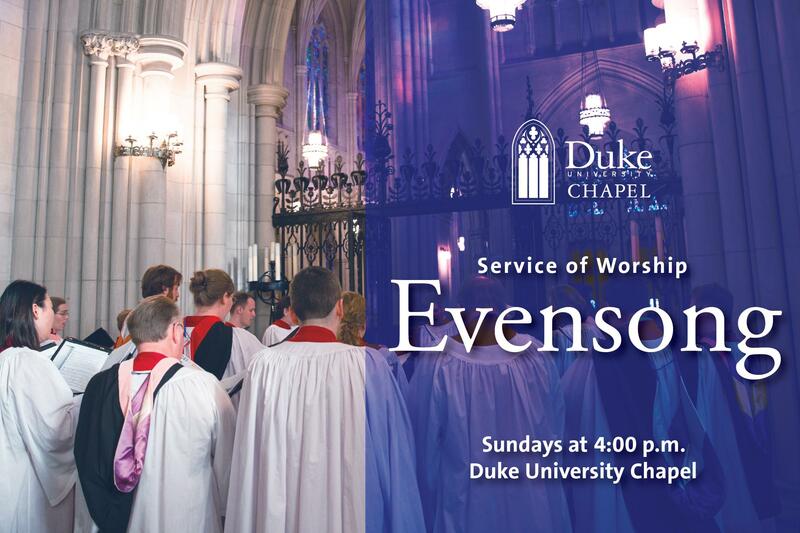 We hope that the prayers of this Evensong, offered amidst the beauty of Duke Chapel, might help you to come closer to our Lord who both commands us to pray and promises to hear us. This year, services will take place every Sunday at 4:00 p.m. from August 26-December 16 and January 6-May 5, excluding December 2 (Messiah) and March 31 (Spring Oratorio). A few Evensong services will be held in the Divinity School's Goodson Chapel, as noted.